These great air pillows go under your above ground pool cover to keep expanding ice from cracking your pool walls. Simply fill the pillow with an air compressor or a bicycle pump. These rugged 16-gauge vinyl pillows absorb freezing waters pressure and helps protect your pool walls. The Air Pillow also reduces excess rain, snow, and leaves on your winter cover. A variety of sizes are available for different pool sizes. Comes with Cable and Winch Tightener. All pillows come with grommets on the corners so you can secure it across your pool with string or rope (not included). 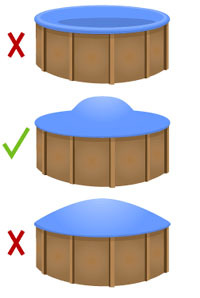 Figure 1 - Shows pool with no air pillow. If it gets very cold and the pool water freezes, it can actually SPLIT the pool wall as the freezing water EXPANDS. That is why you need an air pillow, also known as an ICE COMPENSATOR. Figure 2 - Shows proper air pillow installation. Note that you want the cover to drape over the air pillow, but still touch the water surface. Figure 3 - Shows the cover pulled too tight. Air pillows will not keep all water off the cover and the cover should not be pulled taught over the air pillow. 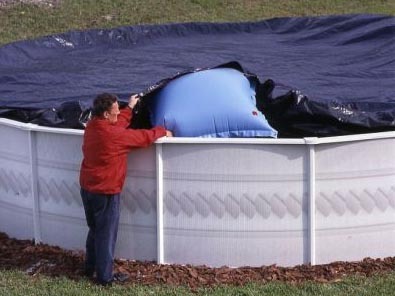 We suggest using the 4 x 4 Air Pillow on pools up to 24' round. Use the 4 x 8 Air Pillow on pools 28' round and up and on small oval pools. Use the 4 x 15 Air Pillow on Large (15 x 30 and larger) Oval aboveground pools. Click the button below to add the Air Pillows For Above Ground Pools to your wish list.